ZZ Top’s newest record release, ZZ Top “Live From Around The World“, has brought forth a wave of inquiries requesting some fun-filled facts on the mystery man, Mr. James Harman, who also appears alongside the band as blues harmonica master on the twin track coupling, “Waitin’ For The Bus” and “Jesus Just left Chicago”. 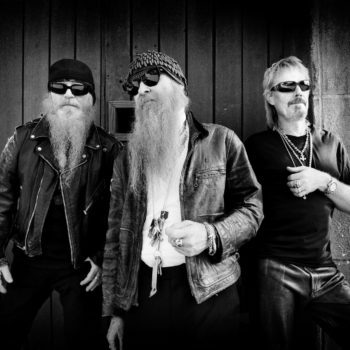 The alliance with James and ZZ Top goes way, way back as far an initial studio appearance with the release of ZZ top’s 12th album entitled, “Rhythmeen” from 1996. James, with his long standing friendship with BFG out in California, accepted the invitation to join the band in studio to be heard on the track, “What’s Up With That” which was the band’s first release from the disc. The popularity of that number landed a spotlight appearance while touring England on the Jules Holland variety TV show in London. That broadcast featured Mr. Harman and his stellar blues harp accompaniment with the band throughout the song. In 2003, Harman returned to appear on the ZZ Top album “Mescalero” for a feature accompaniment with the latin-tinged composition, “Que Lastima” and again in 2012 on, “La Futura” on the blues driven, “Heartache In Blue”. Since then, James has continued to make surprise appearances with Billy and the band along the way, the most recent being the aforementioned stage-call, recorded live from the performance at Nashville’s notorious Ryman Auditorium. For a closer reveal of James and his intriguing background, here’s what folks have to say about Mr. Harman’s fine talents within the world of blues. This Alabama born and raised California-based singer, harmonica player, songwriter, bandleader, and veteran of the blues roadhouse circuit, James Harman has continued to head up various combinations of his James Harman Band with true to the roots Southern spirit, featuring top-notch talent like guitarists Hollywood Fats and Kid Ramos to match his own. With roots in the deepest of blues harmonica greats like Little Walter, Walter Horton, Sonny Boy Williamson, Harman scores consistently with true-tradition original material as good as anyone playin’ and singin’ the blues. As an added bonus with the enjoyable listening James offers, check any of his recorded works including one of our favorites, “Two Sides To Every Story” and the recent release of “Bonetime”…another rockin’ set of sides from our favorite “Mystery Man”, James “Icepick” Harman. i just got Ice Picks new album AND Kid Ramos’… i cant find my t shirt i got yrs ago -and i sure as heck aint payin 300 bucks for a new one-b’sides my dis-a-bility check won’t be there to fill my freezer and put a roof over my head should i lose it and buy it…..
i had to make some room on my piddly 16gig ipod for the two new cds-it was a tough call but ….i sure didnt delete barrelhouse chuck, or that lil ole band from tejas! i also wanna thank you for savin rock in the 80’s-if it werent for y’all and SRV…oh-and waylon willie and david allan coe.